When shopping for credit card deals, it's easy to get carried away by low teaser rates or rewards perks, such as airline miles or cash back, but don't neglect the other terms in the fine print of the contract. Credit Card Rates: Find out what the annual percentage rate is for purchases, cash advances, and balance transfers--they may be different for each. Often the rates for cash advances and balance transfers are higher than for purchases, for example. Rates also may be tiered according to the size of the balance, and there may be a penalty rate for late payments. If a card is advertised with an introductory rate, find out how much the rate will increase when the teaser period is over. Are the rates fixed or variable? Credit Card Grace Period: How long is the grace period, and does it apply only to purchases? The grace period is the number of days you have after you make a purchase before you start paying interest. Be aware, though, if you carry a balance from one month to the next, you lose the grace period. Usually the grace period does not apply to balance transfers or cash advances. Credit Card Fees: We hear a lot about annual fees for credit cards. But credit cards often charge several other fees, as well, such as for cash advances, balance transfers, late payments, charging over the credit limit, credit limit increases, set-up fees, and others. Read about all the possible fees so you don't face any hidden charges. 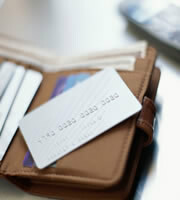 Credit Card Limit: The credit limit is the cap on how much you can charge on your credit card. It's an important number to know because if you charge above the limit, you may have to pay a fee. Also, to protect your credit score, you should keep balances below 30 percent of your credit limit. Maxing out your credit card hurts your credit score. It may be tedious, but reading the fine print now pays off later by protecting you from unpleasant surprises. Once you understand all the credit card's terms, then you can move on to planning how you'll use the card's rewards. 0 Responses to "The Credit Card Fine Print: Four Terms You Should Know Before You Say 'Charge It'"